A strong focus of the game is around several of SEGA’s franchises combined together for fan enjoyment. The change in the game’s title is not due to less focus on general SEGA properties, but to take up less text space. While there are more overall than the previous game, many of these properties are represented bizarrely or improperly and a large portion of the playable cast should be replaced or cut altogether. The majority of both the characters and worlds are recognizable or enjoyable enough regardless if the player knows or cares for it’s origins. Strangely, the core gameplay does not follow this and does not play like any prominent SEGA game in particular. Instead, the gameplay is based on the transformation gimmick of the title. The core goal remains to complete the race or event in the lead or as close to the front as possible, but the vehicle will change into a car, a boat or a plane depending on the terrain that needs to be crossed. Perhaps the most enjoyable portion of this is how many of the courses themselves will change their shape every lap in. Sometimes it is a simple new path opening up, but more often than not it is a part of the level falling apart, another portion of the world crashing into the road or an explosion of some sort. Outside of the four tweaked extra courses from the first game, each level has at least two of the three transformations with every possible combination realized throughout. This instantly makes the game more visually exciting than most competing products in the genre. The prequel Sonic & SEGA All-Stars Racing had a light and easy to comprehend sense of movement. The player needed to focus hardest on the drifting system not just simply for turns, but also for ‘boosting’to build speed. In many cases experienced players could find ways to drift in places they would not typically be expected to. 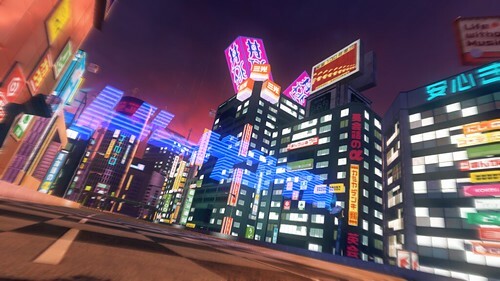 Much of this is lost in Sonic & All-Stars Racing Transformed, but it simply improves the feel of movement and gives inexperienced drifters an easier time catching up to others. This makes the momentum more enjoyable typically, but also does not make the prequel feel pointless like many sporting game sequels typically do. Fans of this game who skipped out on the original will find several reasons to try out it as well. While falling or launching off of a ramp the player is able to pull off a ‘trick’ and if they properly land one or multiple they will receive an extra speed boost. A massive improvement from the prequel is that now each character has the same type of movements they can pull off in the air, which is now done by pushing the right analog stick in a direction. This makes each trick speed predictable and improves the balance between characters greatly. Experienced players can even use this to their advantage to tweak their placement in the air to the left or the right, making daring and crazy driving exciting, but not necessarily the expected way to traverse each course. Unlike the previous game, Transformed no longer includes motorcycles or hovering cars. This improves the balance by making each character generally comparable size, meaning no particular character is always going to be the best possible choice. However, as the game puts heavy importance on how fond people will become of their particular favorites, the option to modify character stats is included. These ‘mods’ typically only slightly, but noticeably alter stats and cannot be changed during multi-race events. On paper these sound as if they would slow down the character selection process or hurt balance, but most are simplified to be immediately and visually obvious how they will impact performance and none in particular are the best possible choice for all occasions. Boating is comparable to the gameplay on land, but with tweaks to the turning and the inclusion of waves that can function as ramps if launched off of correctly. New annoyances that the driving gameplay do not have are created, such as how in some courses with large drops the turning a boat mid-air is the same as if the player were already in the water. Issues like this can be especially problematic as it can be incredibly hard to realign one’s self in boat form. An easy fix would have been a ‘reset’ button, something many other racing games have and one that would have been easy to implement. Flying likely stands out the most as the majority of the mechanics are tweaked in several ways. Most noticeable is how the trick system is replaced with rolling and spinning in the air, mostly meant to dodge. If some sort of obstacle is avoided just right before impact was made the player will receive an immediate boost, but will not be able to turn as well during it, which could lead to more danger. There are slight visual cues to guide players where to fly in this mode, but sometimes it can be confusing as to just how far one can move without ‘falling out’ of the level, an issue all vehicle types have to a degree with how much movement can happen in the courses. Although gameplay on land is the most polished, well-planned and flying is the least by far, each one is enjoyable. The game would not feel complete without all three. As expected with the party racing genre, players will come across randomized power-ups throughout the race course. These can then be held and used later on whenever the player chooses. Unlike something like Mario Kart however, these items are not inspired by anything in particular and can be continue to be held even if the player is hit or falls off the level. This adds greatly to the potential strategy, especially when the character-specific all-star abilities come into play – Which now can be used online. Whatever they lack in interesting design is made up tenfold with how unique and creative they are in use. Items like the basic shield from the last game are replaced with a catcher’s mitt that not only defends against attacks and obstacles, but can capture smaller attacks and then store it to use against others. Other clever concepts are how items with multiple attacks can all be used at once if the button is held or how there are some secret stronger power-ups hidden in especially dangerous locations. With all of the thought put into how to fight against the other players it is impressive that many of these can be easily avoided and how there is no particular item that always succeeds without planning of any sort. The entire genre can improve if other developer’s pay attention to what SUMO Digital has done with these items, but it is still disappointing that none are inspired by anything from SEGA’s history. The World Tour is presented as the core mode of the game and replaces the missions from the previous game. This is where the majority of the game’s content will be presented and unlocked for player access. 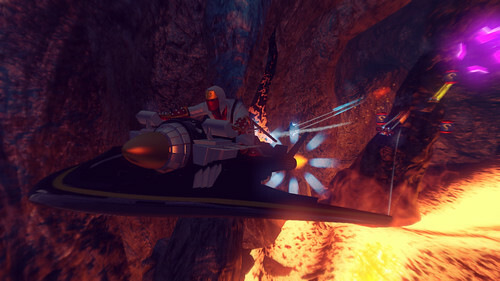 Most events are races or unique variants that teach the play mechanics in some way without feeling like a tutorial, such as a drifting event where players need to stay within pre-set lines or a flying-only mission high above the level with hoops that need to be flown through. The majority of these are not at all easy and some players may have trouble finishing most, let alone unlocking everything. To combat this somewhat are difficulty selections that give rewards based on how difficult the player had the event set. If the player has trouble with this still they are given a free pass for failing the easiest difficulty four times. Another helpful inclusion is a slot machine that can give players a bonus chance and start the next event with a potentially very helpful power-up or have a special immunity to certain items. As this is random and requires the player to collect coins during races to even use, it’s effects are minimal and could never seriously change the tide of an event. As many would expect from a party racing title, a ‘battle’ mode dedicated to driving around in a small arena and throwing items at one another is included. Although not a direct clone, this is all just a lazy forced attempt at copying what the Mario Kart series has. Nothing especially unique is present, each field is based on courses already in the core game and and even the transforming gimmick is not available during them. Hopes of aerial or boating fights are not realized and no AI enemies are even made available. Although it is nice that unlike the prequel, this mode is now playable online, all assets used for this feature should have been to make the multiplayer in World Tour mode available online instead. The vast majority of the soundtrack is made up of modern remixes of songs found throughout SEGA’s unique history in video games. Some tracks featured are upwards of thirty years old, but most are from the past ten years. Directed by the legendary video game musician Richard Jacques, Sonic & All-Stars Racing Transformed’s music comes off as one of his weakest efforts in his long career. Many of the chosen songs work decently enough for their respective course, but most are only slightly tweaked or edited to sound different instead of being a true remix. Several seem either picked at random or chosen only because they are the first song heard in the game, such as the Chapter 1 song “Flight” being used for the driving segment of the Panzer Dragoon level. Regardless, the soundtrack is at it’s core still very enjoyable as many of the songs have generally excellent original compositions. The only songs that are particularly damaged in any way are the OutRun series’ tunes, which do not at all fit with the setting or nature of the franchise and are borderline offensive to the original material. Voice acting in Transformed is largely reused clips from recent games. This appears to be a mistake and makes characters seem stranger than they usually are, such as when they are caught in a massive explosion and only casually sigh or get passed by several racers and shout their own name. Amy Rose and Ulala become especially jarring with the former constantly shouting quotes that clash with her personality such as “I’ll destroy all of you” and the latter constantly saying “Spaaaace Channel 5” seemingly regardless of context. Exceptions are made as several characters have dialog specifically recorded for the game. These characters almost always sound more natural, but many still have strange behaviors regardless. The obnoxious announcer from the previous title has been replaced with a new, more standardized racing voice actor. Instead of constantly talking and telling random, uninspired jokes during races he simply mentions what is directly happening or gives basic congratulatory words to the players. Easily an improvement from the last, he still finds ways to become grating, such as when doing a countdown from ten (which also includes shouting zero) or constantly telling the player to select something while they wait in the menus. The level scope in Transformed is comparable to the variety found in the level direction of 2011’s Sonic Generations (a platformer), but at times can seem much grander. 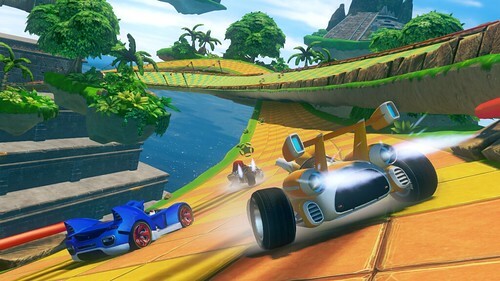 Not counting the four returning locations from the past game, Sonic & All-Stars Racing Transformed has less courses overall than it’s prequel, but because of their scale, how they morph between laps and how no level themes are re-used, the game manages to feel far more diverse, rich and satisfying than the original. More franchises are also represented in this regard, but many feature references across more than a singular game, such as how there are recognizable objects and locations from four Panzer Dragoon games in it’s respective level. Not every course gets this type of attention sadly as something like the course based on the Shinobi game franchise uses absolutely nothing from any game in the series and instead is just a generic traditional Japanese village that changes seasons between laps. Character animations are less obnoxious than the prequel, but still unnecessarily silly and are almost always clash with their personality. Although they happen less often overall, they can still become extraordinarily distracting, especially in cases where large characters (such as Dr Robotnik) stand up and block the player’s viewpoint for three or more seconds. 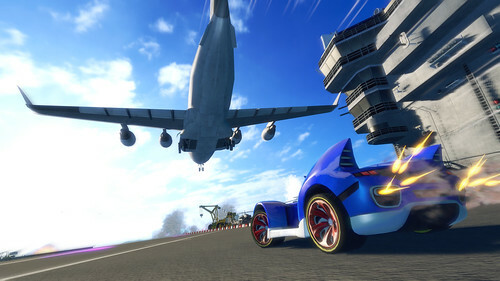 However, the vehicles transforming is typically enjoyable, with most making unique and creative sounds that never interrupt the race. The boating and flying gameplay styles do not overly complicate the game and the player is typically given a few seconds to comprehend that they are in different vehicle type before a turn or some sort of danger is close by. 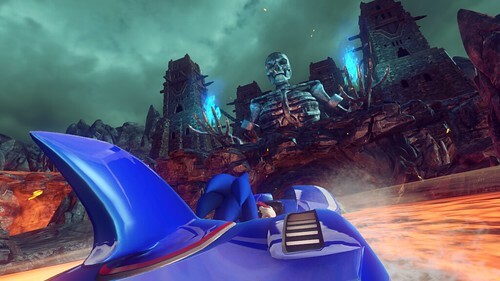 Noticeably less vivid in it’s use of colors than the prequel, Sonic & All-Stars Racing remains bright and cheerful, even if some of the courses are specifically designed to appear menacing in nature. Textures can stand out as muddy and sometimes have very little detail to them, but no more than recent modern Sonic video games. With far more environments and ways to traverse than basically every other family-friendly racing game, it is hard to find fault in this regard. The handheld versions (PlayStation Vita and Nintendo 3DS) look the worst due to hardware limitations, but are still competent and comparable to the console versions. Some mechanics differ greatly in the Nintendo 3DS release specifically, but it is still overall a very similar product and not a new experience, like SEGA Superstars Tennis and Sonic & SEGA All-Stars Racing were on the Nintendo DS. With that said, it is still by far the worst of the bunch and all potential players should consider getting the game for a different platform. The console and handheld versions of Transformed feature two guest characters from non-SEGA properties in the game’s playable roster, those being auto racer Danica Patrick of NASCAR fame and the character Ralph from the 2012 Walt Disney animated film Wreck-It Ralph, which features several cameos of SEGA characters including Sonic the Hedgehog, Dr. Robotnik (Eggman) and a zombie from The House of the Dead, as well as characters from Altered Beast and Cyborg Justice. Interesting to note is Wreck-It Ralph is voiced by John C. Reilly, the same actor that portrays the character in film, and the in-game character uses several unique lines of dialogue recorded for the express purpose of the game. Other guest characters appear in the Steam version of the game for PC, those being the titular Manager from the Football Manager franchise, a Shogun from Total War: Shogun 2, and the Scout, Heavy, and Spy from Valve Software’s Team Fortress 2, with the later characters sharing the same vehicle. While the inclusion of these extra characters is appreciated, one must question the dubious lack of thought put into them and their designs. Why they felt the need to include a nameless, faceless Shogun from Total War — a series that is not known for its characters — and not a playable level is strange, while the Football Manager that appears in-game does not appear in any of his respective games, as the player is supposed to be to the Football Manager, and thus his representation here makes little sense. Of all of the promotional content produced by SEGA to promote Sonic and All-Stars Racing Transformed, no other property featured in the game was more prominently displayed than NASCAR driver Danica Patrick. Patrick — who drives car number 10 for the Stewart-Haas Racing team — is heavily featured in many promotional works for the game, including commercials, trailers, and she has made appearances at various live events sponsored by SEGA to showcase the game. This relationship culminated when in 2012 when SEGA had an actual race car built for Patrick, which she raced in the Nationwide Series O’Reilly Auto Parts Challenge. She finished in 8th place. The vehicle that Patrick drives in-game is modeled after a toy car that was created in collaboration with SEGA, NASCAR, and toy manufacturer Hot Wheels, which has been dubbed as the ‘Danicar’ and was made available with pre-orders of the game made at GameStop. 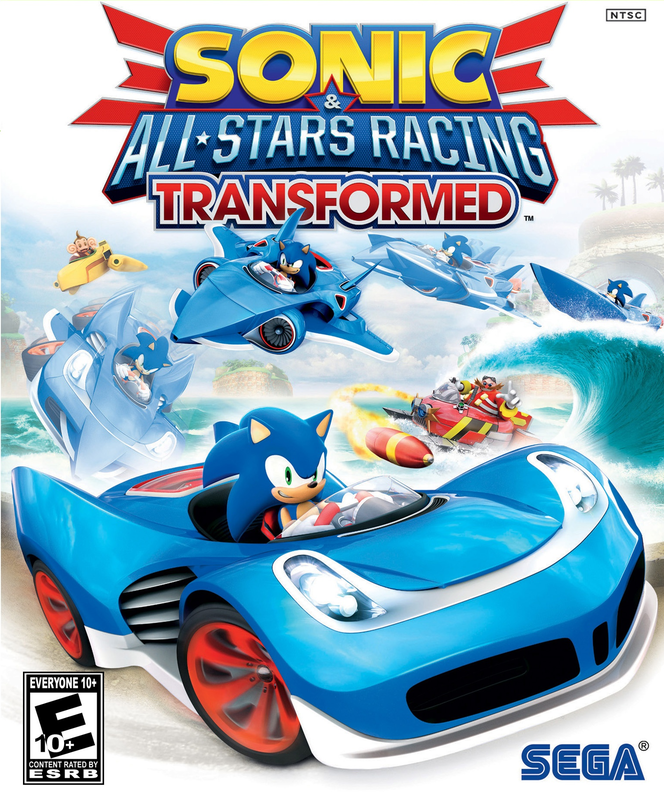 If presented as simply a special treat for fans of SEGA, Sonic & All-Stars Racing Transformed fails in many regards. The selection of properties is awkward, the power-ups and gameplay do not even try to reference anything from the company’s history and some extremely important and ongoing franchises such as Virtua Fighter, Yakuza, Phantasy Star and any SEGA racing series are confusingly and insultingly excluded. However, none of that matters when the core gameplay and modes are so well planned and produced. Fast and frantic, but solid and smart, Sonic & All-Stars Racing Transformed is a creative and difficult, but balanced racing game that can be fun for everyone able to hold a game controller. Although several factors (such as glitches) hold the game back from being a true classic, this is easily one of the best recent games in the genre and can seemingly only get better with sequels. Formats: Xbox 360, PlayStation 3, Steam for Windows PC, Wii U, Vita and Nintendo 3DS. This entry was posted on February 17, 2013 at 10:17 am and is filed under AfterBurner series, Crazy Taxi series, Football Manager, Golden Axe series, iOS, Mobile Platforms, Nintendo 3DS, PC, PlayStation 3, PlayStation Vita, Review, Shinobi series, Sonic & SEGA All-Stars Racing, Sonic the Hedgehog series, Space Channel 5 series, Space Harrier series, Steam, SUMO Digital, Super Monkey Ball series, The House of the Dead series, Total War series, Wii U, Xbox 360. You can follow any responses to this entry through the RSS 2.0 feed. You can leave a response, or trackback from your own site.